In March 2018 we launched “Beyond the Lecture” a monthly series on ActiveHistory.ca dedicated to teaching Canadian history at the post-secondary level. This series has – and continues to – create a space to expand perspectives, deepen insights, and challenge assumptions about history education. The series has presented us with an opportunity to both highlight the wonderful work already being done by educators across the country while also providing us with a forum to circulate these ideas more widely. At the same time, the series has created an online community where educators can share and circulate ideas, learn from each other, collaborate, and continue to grow. 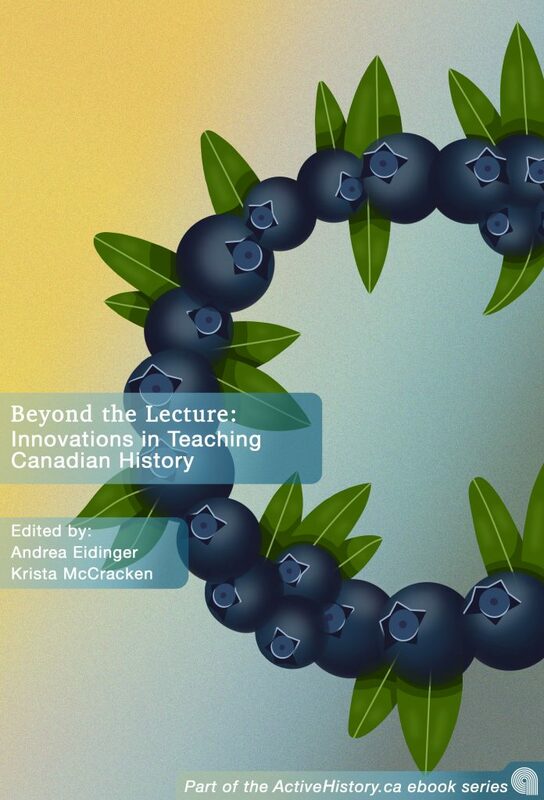 Today, we are pleased to announce the publication of a new open-access ebook edited collection based on the series, Beyond the Lecture: Innovations in Teaching Canadian History. This ebook is available in several formats for your reading enjoyment, including a fully online version as well as downloadable versions. Our decision to create an ebook was inspired by a desire to extend the life of the original Beyond the Lecture blog posts and to highlight the broad themes which have emerged throughout the series. This open access ebook also developed out of the enthusiasm, insight, and conversations that were sparked by the Beyond the Lecture blog series. This book compiles pieces from the Beyond the Lecture series and the Active History site more broadly, as well as blogs like Borealia, The Otter/La loutre, and Unwritten Histories. It also builds more broadly on discussions taking place at all levels about the value of a university education and the importance of history as a field and a discipline. Beyond the Lecture ebook, click on cover to visit ebook. This launch coincides with the launch of Active History’s new Publication section and the new ActiveHistory.ca ebook series. The Active History ebook series brings together some of the best writing published on ActiveHistory.ca in an accessible, open-access format. Its thematic collections focus on connecting historians to the public and the past to current events. A second publication in this series will be launched next week. The book is organized into five different thematic section, each one dealing with what we believe is a pressing issue in the field of Canadian history education: active learning and experimental pedagogy; digital history and technology in the classroom; teaching the Canadian history surveys; challenging pedagogy; and Indigenous education and reconciliation in the classroom. The book begins with an all-new introduction written by ourselves and a reflection on the scholarship of teaching and learning by Andrew Nurse. The active learning section examines innovative approaches to teaching Canadian history, including examples of gamification as a way to teach historical thinking, field trips, and infusing primary research into classroom spaces. For professionals looking to adopt new teaching practices this section includes fresh ideas and practical approaches to teaching Canadian history. Digital history and technology in the classroom discusses open educational resources in Canadian History, the use of Twitter in the classroom, and how new technology can shape student experiences of history. This section tackles the ways in which Canadian history scholarship, teaching and learning, and technology can intersect to provide meaningful engagement opportunities for students. The section on teaching the Canadian surveys considers how we might update this staple of Canadian history education. These pieces discuss how we might modify the Canadian history survey into order to make it more inclusive and reflective of Canada’s diverse history, whether this means taking a continental approach to the subject and integrating often-overlooked histories into the course. The pieces in this section also ask difficult questions about the purpose of the Canadian history survey, and how we might better serve our students by focusing on skills as well as content. In our section on challenging pedagogy, we have included three pieces which consider how to handle difficult topics in the classroom in a manner that is both impactful and supportive. This section also places professors in the role of learners, encouraging them to confront their relationship to the material that they are teaching as well as their own internalized biases. Lastly, the Indigenous education section examines the ways in which educators can uplift Indigenous voices and use Indigenous created resources in the classroom. These pieces are about doing the work, transforming approaches to Canadian History, and acknowledging the colonial roots that lie within Canadian historical narratives. The book concludes with a brand new afterword by Samantha Cutrara, reflecting on meaningful learning, as well as a list of online Canadian history education resources. As public and digital historians, we strongly believe in the principles of open-access, and are committed to making our work accessible to communities and scholars both in and outside academia. By making this publication freely available we aim to reduce socio-economic barriers to knowledge, while promoting equality of access. This effort to reduce barriers to information and education are not new to ActiveHistory.ca, indeed since its establishment in 2009 the Active History website has made all of its content and blog posts freely available under a Creative Commons License. Likewise, members of the Active History editorial collective have been involved in the the development of the Open History Seminar: Canadian History textbook and strong advocates for the adoption of open pedagogy within Canadian History. We would like to also take a moment to acknowledge our wonderful contributors, who when asked if they were interested in an open-access ebook edited collection on Canadian history education said “Yes!” rather than “What on earth are you talking about?” So please take a moment to raise a class to: John Belshaw, Benjamin Bryce, Claire Campbell, Tim Compeau, Samantha Cutrara, Sanchia deSouza, Joel Dickau, Edward Dunsworth, William Fysh, Benjamin Lukas, Kari North, Maris Rowe-Mcculloch, Lindsay C. Sidders, Hana Suckstorff, Nathaniel Thomas, Erica Toffoli, Spirit-Rose Waite, Jessica DeWitt, Thirstan Falconer, Crystal Fraser, Adam Gaudry, Heather Green, Skylee-Storm Hogan, Sean Kheraj, Sara Komarnisky, Kathryn Magee Labelle, Catherine Larochelle, Daniel Laxer, Mark Leier, Zack MacDonald, Jean-Pierre Morin, Alison Norman, Andrew Nurse, Daniel Samson, Tom Peace, Geoff Read, Daniel Ross, and Sarah York-Bertram. Finally, we would like to note that that is not the end of the Beyond the Lecture series. Far from it. We are continuing to accept submissions for the series on Active History, and hope to eventually publish a second volume. For more information on how to submit to this series, please go here. We would also encourage you to read all of the other posts in the series, which you can find listed here. We look hope this publications and subsequent ActiveHistory.ca ebook publications continue to extend conversations about publishing, openness, and accessibility within the Canadian History field. Access the Beyond the Lecture ebook.